After 36 years of working for member libraries, Val Catlin is retiring from MVLS. Her last day at work is today. Val has done a great variety of jobs here at MVLS, but her most memorable impact has been in three areas: annual reports, interlibrary loan and technology & computers. Val’s meticulous attention to detail, her no-nonsense work ethic and her eagerness to be of service to all member libraries – and to libraries throughout CDLC – will be greatly missed. 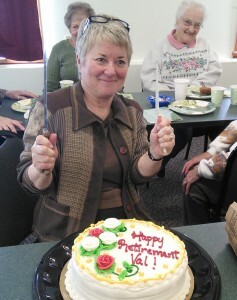 Enjoy your retirement, Val! You have earned it.